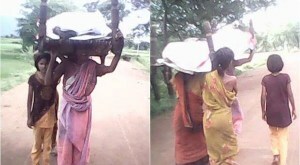 What is happening in Odisha state? That is how one is tempted to ask when we read the continuous stories of human depravity, total loss of a sense of belonging and whether people there care to worry about their what is seemingly their daily on-going increased neglect of the people by the government and the elite classes? 48 deaths of encephalitis in four weeks? In Kalahandi, daughters dismantle roof for mother’s funeral. Then of course the repeated news about the lack of ambulance to carry the dead or the ambulance abandons a body on the way to hospital…. Can anyone hear such horror stories from a state ruling by a party and a leader who can’t speak his mother tongue and only English he speaks and yet he is loved by his people and repeatedly elected for the many terms! This is from a state which is so rich in so many resources, minerals and other resources where the foreign investors love to invest and where there are so many opportunities to give a good governance and yet this sadly is missing and hence to series of such heart-rending, heart-breaking stories. The Central government authorities be it the health department or the other departments that must have acted to set things right. So far as we are able to make out no further critici9sm from the larger public or the tech savvy Prime Minister who sends out dime a dozen tweets on all sorts of issues did it seem to have expressed his own horror. Are we creating a health infrastructure, the latest developments in telemedicine and policies that must enable even the poorest must be able to access modern facilitieis, must be able to utilise the services like ambulances. A minimum and decent healthcare must be at the disposal of the poor, right? We have so much expertise, so man y experts and so much technological tools. Why not the Odisha government call for experts like Dr.Devi Shetty or the IT wizards like Nandan Nilekani to give some blueprint like a total coverage and emergency services that would go to help everyone at the remotest of the parts of the country. Surely, there must be a special package of help in health emergencies in states like Bengal too where too we hear often horror stories in infant mortality. Eastern Indian states are poorly served. That is clear. We are just outsiders and we don’t know much of the ground reality.But from the many statistics that are published from the mainstream media India’s health sector needs urgent priority. Niti Aayog is doing some very wonderful initiatives and it has to turn its attention to healthcare issues in the rural Indian space. Telemedicine is one tool that must be at the disposal of the primary health centres. Panchayat Raj ministry also must be brought in when it comes to medical emergencies in the panchayats.As of now, more so in the South and may be this is also true of the North, Panchayat raj bodies are more revenue-departments controlled? There is no other way except to involve and entrust the grassroots institutions to take care of the core health emergencies at the grassroots. There is no virtue, we say, when one political party gets elected term after term.These parties often leave back a legacy of much wrong, not just corruption alone. Bad governance has many facets. This one instance of health emergencies at the grass roots is one such bad legacy.